Compiled by John Rattigan on behalf of the Clare Branch of BirdWatch Ireland. 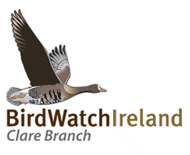 This report is based mostly on observations recorded on the Scarce and Rare Birds page of www.clarebirdwatching.ie, the web site of the Clare Branch of BirdWatch Ireland. It covers a total of 184 days out of a possible 365, with most of the records coming from the second half of the year. This imbalance can be explained by the increased number of observers in Clare during the Autumn, though there is no doubt that the launch of the web site in mid-summer raised awareness of the daily recording of observations which in turn led to increased submissions. It was a very good year for rarities in Clare with no less than four species, Spotted Sandpiper, Citrine Wagtail, Red-necked Phalarope and an American-race Rough-legged Hawk added to the county list which now stands at 302. In an extraordinary co-incidence, the second record of Red-necked Phalarope followed hot on heals of the first, while Lesser Yellowlegs and Arctic Warbler were also recorded for the second time. Other major rarities included Firecrest (fourth record), Baird’s Sandpiper, (fourth), White-rumped Sandpiper (fourth), Semipalmated Sandpiper (fifth), and Long-billed Dowitcher (eighth record) and an American Golden Plover (eigth record). The year was notable for the unprecedented number of Neararctic waders that were found at Doonbeg. Offshore, a Little Shearwater, four Fea’s Petrels and twelve Wilson’s Storm Petrels added some spice to birding off the Bridges of Ross in the Autumn, while other lucky observers had another Little Shearwater and a Wilson’s Storm Petrel at sea, 22 nautical miles north-west of Loop Head. Off the north coast of Clare, Black-throated Divers were observed in Galway Bay as usual, though numbers were not high, while an Eider was seen off Finvarra Point. Other rare ducks found in the county included several Ring-necked Ducks during the Winter months and early Spring, while a Garganey was a nice find in the Autumn. Little Egrets continue to grow in numbers in the county with a record thirteen found together at Shannon Airport Lagoon. Gulls are always well watched in Clare, though there were no major rarities found during the year. The only Neararctic gulls reported were Ring-billed Gulls, several Iceland, Glaucous and Sabine’s Gulls put in appearances between Quilty and Loop Head. Several Mediterranean Gulls were also seen. Apart from the Rough-legged Hawk, the only other rare raptor species found in the county a was Marsh Harrier. There were four records in the county in August and September, though they probably all refer to the same bird. It was an excellent year for Nearactic waders with a Semipalmated Sandpiper, a Baird’s Sandpiper and up to three Pectoral Sandpipers all found at Shannon Airport Lagoon, while White-rumped Sandpiper’s were observed at Poulnasherry Bay and Quilty. Four Long-billed Dowitcher’s were recorded, two at Shannon Airport Lagoon and two at Doonbeg. Lesser Yellowlegs was also found at Doonbeg. While for some the well-watched Citrine Wagtail and the briefly-seen Arctic Warbler were the show stopping passerines of the year due to their extreme rarity, for many others the year will be remembered for the irruption of Waxwings that took place during the Winter of 20042005. A flock of up to 30 birds was seen regularly around Ennis and brightened up many a dark winter day until they returned north in April. The sequence followed is that of Professor K.H. Voous’ “(1977). Some records within this report may not have yet been accepted by the Irish Rare Birds Committee (I.R.B.C.). For rare species with bracketed numbers e.g. Red-necked Phalarope (1,1), the first number stands for record of occurrences within the county Clare to date and the second one for number of occurrences within the year covered by this publication, 2005. 12 on 27th, and six on 28th. there on 22nd November and 28 on 17th December. Querrin: three on 13th February. with six there on 22 November and three on 13th February. on then 20th November and was the highest daily tally recorded during the year. Ballyvaughan: three at Bishops Quarter on 14th January. Two were present off the pier on 22nd January. Ballyvaughan to Black Head: 30 were seen on 12th February, 50 on 5th April and five on 30th December. Black Head: one, summer plumage on 4th April. North Clare: eight birds were present on 30th December. Lahinch Bay: eight on 22nd November. Quilty: one, Seafield on 16th November. Traught Beach: one on 30th December, three at Bishops Quarter on 14th January. 50 on 5th April and five on 30th December. one, summer plumage on 4th April. Eight birds were present on 30th December. eight on 22nd November. 20th November the most recorded on a single day during the year. Ballyvaughan to Black Head: only three on 12th February, increasing to 28 on 5th April. There were eight on 30th December. Black Head: a pure albino bird was recorded on 12th and 13th February; 50 were seen there on 4th April. Bridges of Ross: one in summer plumage on 23rd September. A single bird was seen there on 1st October. Kilkee: : two were present in the bay on 26th December. Liscannor: : three on 14th November. Traught Beach: : two on 30th December. a pure albino bird was recorded on 12th and 13th February; 50 were seen there on 4th April.one in summer plumage on 23rd September. A single bird was seen there on 1 October. : two were present in the bay on 26th December. three on 14th November. : two on 30th December. Poulnasherry Bay: one was seen on 23rd January (Maeve & Christy Meehan). Bridges of Ross: one blue phase bird on 19th September. one blue phase bird on 19th September. 19th July and 23rd September. 50 on the 18th August and 41 on 4th of the month. At Sea: several seen from a boat 22 miles N of Loop Head, 23rd August. July: one on 19th, two on 23rd. August: one on 31st, three on 24th, seven on 19th, 11 on 21st, 15 on 29th, 30 on 17th, 41 on 4th, 50 on 18th, 71 on 3rd, 600 on 5th. September: singles on 3rd, 4th, and 23rd, two on 10th, three on 7th. and 322 on 23rd August. At Sea: 300, seen from a boat 22 nautical miles N of Loop Head, 23rd August. July: a single bird on 19th. August: Two on 19th, 21st, and 24th, three on 13th, seven on 18th, eight on 4th, ten on 3rd, 22 on 23rd, 45 on 5th, 330 on 29th. September: one on 15th, eight on 23rd and 23 on 7th. October: : 1,700 on 2nd. Kilkee: six at Illaunonearaun on 11th August. Four birds were the most recorded in a single year in the county. 14th August (Christophe Gruwier), 24th August (John N Murphy), and 25th August (Aidan Kelly). while another was observed from the Bridges of Ross on 31st August (Noel Keogh, Niall Keogh). Spring: A large raft of several thousand birds was seen off the tip of Loop Head on 16th April. Bridges of Ross: 8,000 on 31 August; 15,000 on 24 August; 27,000 on 13 August. 8,000 on 31 August; 15,000 on 24 August; 27,000 on 13 August. 1,500, 2 September. high counts of seventeen on 23rd August, fifteen on 24th and nine on 21st of the month. eight 13th, nine on 21st, fifteen on 24th, seventeen on 23rd. September: singles on 1, 19 and 20, two on 3, 23 and 25.
singles on 1, 19 and 20, two on 3, 23 and 25. Between 19th July and 2nd October of total of 4,080 were recorded on 31 dates. 150 on 1st, 220 on 27th, 450 on 23rd. Kilkee: 20, Illaunaneareann, on 11 August. Storm Petrel Hydrobates pelagicusCommon passage migrant. A total of 675 birds were recorded on 14 dates between 19th July and 2nd October. High counts were 173 on 13th August and 100 on both 21st August and 23rd September. July: 25 on 19 July. 70 on 23rd, 80 on 4th, 100 on 21st, 173 on 13th. October: 45 on 2. 100 on 23. 45 on 2. Wilson’s Storm Petrel Oceanites oceanicusRare vagrant. A total 16 birds were reported on eleven dates from 23rd July to 5th September. At Sea: one, 22 miles N of Loop Head, 23 August (Kieran Cronin ). one, 22 miles N of Loop Head, 23 August (Kieran Cronin ).one on 30 (Colum Flynn, Owen Foley). Three were feeding with Storm Petrels, on 23rd (Stan Nugent, Paul Milne, John N Murphy, John Rattigan). on 22nd (Jim F Dowdall), on 23rd (Michael Hoit, Niall Keogh), and 29th (Jim F Dowdall). on 13th (Aidan Duggan, Brian Finnegan, Raphael Lebraun, Noel Lenihan, Killian Mullarney). September: one on 5 September (Carol Inskipp, Tom Inskipp). one on 5 September (Carol Inskipp, Tom Inskipp). A total of 186 birds were recorded during the year. Bridges of Ross: two were seen on 28 May and another two passed on 23 June. A total of 177 birds were recorded on sixteen dates between 24th August and 2nd October. High counts were 110 birds on 1st October, thirteen on 27th September and twelve on 28th September. August: two were seen on 26, five on 1, nine on 23, 12 on 28 and 13 on 27. September: singles on 2, 20, 24 and 25, five on 1, nine on 23 and 12 on 28. October: 110 on 1 with two on 2. Kilkee: five at Illaunaneareann on 11 August. two were seen on 26, five on 1, nine on 23, 12 on 28 and 13 on 27.singles on 2nd, 20th, 24th and 25th, five on 1st, nine on 23rd and 12 on 28th.110 on 1st with two on 2nd. The species was recorded in every month except May and June, the height of the breeding season. Airport Lagoon on 19th is a county record. Ballyvaughan: one, Bishop’s Quarter from 27th November – 3rd December. Corofin: three flying over Kilnaboy towards Kilfenora on 12th April. Doonbeg: one in the bay on 17th December. Kildysart: one on 5th March; two there on 17th March. Kilkee: two at Blackweir Bridge on 13th February. Labasheeda: one was present on 30th January, with two there on 2nd September. Lahinch: one near the bridge in the Inagh estuary on 17th December. Newmarket-on-Fergus: one, Lough Gash on 16th October. North Clare: one at Corranaroo on the ClareGalway border on 25th November. there on 13thAugust, 15th August, and 17th August; A total of ten on 17th December and three on 26th December. At Moyasta there were seven on 8th February, with two there on 19th March and 7th November. Querrin: one on 30th January. Shannon: at the Airport Lagoon there were four on 23rd March and four 30th July. were four on 16th September. In October there was one at Inishcullen Hill on 16th. 81 on 27th November, 70 on 4th December, 19 on 11th, 79 on 18th and five on 25th. Corofin: two, Lough Atedaun on 4th September. Ennis: 29 at Ballyallia on 13th November. Kilkee: 17 were present at Tullagher Bog on 29th January. Kilrush: six, in a field outside the town on 2nd November. Nine, at Farrihy on 28th October. Shannon: one, at the Airport Lagoon from 30th July – 5th September, joined by a second on 2nd August. There were five there on 16th October. Ennis: one, Ballyallia Lake on 18th April. 15 on 6th October. The highest number recorded during the year was 24 on 26th December. Small numbers were observed at Carrowmore Point and Doonbeg during the winter. Doonbeg: 300 in a field near the bay on 29th January. Kilkee: 156 at Goleen on 16th January. Quilty: a flock of fifty was observed on Mutton Island on 19th March. Bridges of Ross: a flock of nine flew south, 3rd September. Two were seen on 28th. Doorus: 108 on 6th March was a high number for North Clare. Bridges of Ross: a flock of nine flew south, 3rd September. Two were seen on 28th September. 108 on 6th March was a high number for North Clare. Knock: 71, off the pier on 30th January. Poulnasherry Bay: a total of 127 were present on 17th December. Newmarket-on-Fergus: 38, Lough Gash on 30th March. This was the high count of the year. Shannon: 14, Airport Lagoon on 16th October. 38, Lough Gash on 30th March. This was the high count of the year. 14, Airport Lagoon on 16th October. Bridges of Ross: three passed on 30th August. Moyasta: three on 7th November. Poulnasherry Bay: a total of 50 were recorded on 17th December. Corofin: about 3,000 were at Lough Atedaun on 30th January. Poulnasherry Bay: 600, was a highest winter count from this site on 17th December. Shannon: one, Airport Lagoon on 13th August. Shannon: 300, Airport Lagoon on 8th September. and 25th November (Tim Griffin). A female was present at Kilcredaun Marsh on 16th –17th September. Numbers have declined in recent years. Knock: 21 birds were present feeding off the pier on 30th January. Corofin: one, female, Lough Inchiquin on 4th April (John N Murphy). (Stan Nugent, John N Murphy). Kilmihil: a bird in eclipse plumage was seen at Knockalough on 24th November (John N Murphy). One was seen off Finvarra Point on 25th February. Recorded on passage at the Bridges of Ross on nine dates from 19th July – 19th September. The numbers wintering in Liscannor Bay have declined significantly in recent years. July: ten, on 19th July, five on 23rd. August: three, 4th, 33 on 30th, 32, on 31st. September: 39 on 3rd, five on 7th, 17 on 10th, five on 19th. Ballyvaughan to Black Head: 12 were seen on 12th February, with 15 on 5th April. Liscannor Bay: Numbers have declined sharply at this traditional wintering site in recent years. Only 45 were seen on 26th January, 40 on 22nd November and 50 were present on 17th December. Single birds passed the Bridges of Ross on 5th (Graham Catley et al) and on 24th September (John N Murphy & John Rattigan). These were the only records received. A total of 14 were seen between Aughinish Island and Finavarra Point on 20th November. The following three records probably refer to the same bird. Quilty: one, Lough Donnell, on 9th August (Frank O’Duffy). ; one, on 27th November (Phil Brennan). Loop Head: one, Rinvella Bay, on 18th September (Christy Meehan and John Wright). Hen Harrier Circus cyancusScarce resident and passage migrant. Recorded in every month except February, April, June and July. Loop Head: one female, Kilbaha on 23rd January. Single birds recorded on 5th October and 9th October. One was seen at Kilbaha on 2nd November. Mount Callan: one, male, near The Hand, on 23rd May. Poulnasherry Bay: one, juvenile, on 2nd August. A male was seen there on 26th December. Maghera Mountain: one, on 11th August. Lissycasey: one on 13th November. Cratloe: a female was seen near Woodcock Hill on 20th December. Labasheeda: one, female, Slievedooley on 4th December with another female in the area on 28th. Clonderlaw Bay: a female ring-tailed bird was seen on December 27th. A juvenile Rough-legged Hawk was found in a weak condition and taken into care on 11th October (Alan Donovan). After Alan’s dedicated hours of nursing this bird back to health it was decided to re-release the bird back to nature. A decision was made to release the bird in an area where other Buzzards were commonly found with the hope that the Rough-legged Hawk would join them and socially hunt giving it a better chance of survival back in the wild. The most suitable place in the country seemed to be the Wexford Wildfowl Reserve an area similar to that of the natural hunting grounds where these birds are commonly found in the US. It was subsequently released back into the wild at Wexford Wildfowl Reserve on 2nd November. This is the first Clare record this species. One juvenile, Loop Head on 15th October (Simon Berrow). Recorded singly at several sites during the year with two at The Fodry, Loop Head on 7th November. Labasheeda: one on 23rd January. one The Fodry on 7th November. Moyasta: one on 7th November. Liscannor: one at Clahane on 22nd November. Poulnasherry Bay: a dark phased bird was seen on 17th February (Maeve & Christy Meehan). Doonbeg: a dark phased bird was seen on 26th December. (Maeve and Christy Meehan). Mount Callan: a flock of up to 16 were seen around mid January. The highest count was of 100 on 17th December at Poulnasherry Bay. Loop Head: 21 on 30th October; a total of 100 at The Fodry and near the Lighthouse on 2nd November. 21 on 30 October; a total of 100 at The Fodry and near the Lighthouse on 2 November. Poulnasherry Bay: 3,000 were present on 17th December. Shannon: 4,000 on the mudflats near the airport on 17th November. 2,500 were observed at Tullyvarragh Marsh on 25th December. Loop Head: one juvenile near the Lighthouse on 30th October (Christy Meehan); seen again, 4th November (Tom Tarpey). Kilkee: 400 on 22nd January. Poulnasherry Bay: 3,000 were seen on 17th December. 3,000 were seen on 17 December. Poulnasherry Bay: a high count of 200 on 17th December. a high count of 200 on 17 December. Shannon: 40, Airport Lagoon, on 7th September; 400 on the mudflats near the airport, on 17th November. 40, Airport Lagoon, on 7 September; 400 on the mudflats near the airport, on 17 November. The two main sites are Lurga Point, Quilty and Kilkee Beach with smaller numbers at Liscannor Bay and Ballyvaughan. This species is found at one main site on the beach at Lurga Point/Seafield just outside Quilty. Here the flock is of international importance with numbers, with few records from other sites around the county emphasising the importance of this site for this species. Quilty: twenty, Seafield, on 16th November; thirty on 22nd November. : twenty, Seafield, on 16 November; thirty on 22 November. Shannon: 400, Airport Lagoon on 8th September; 8,000-10,000 on the mudflats near the airport, 17th November. : 400, Airport Lagoon on 8 September; 8,000-10,000 on the mudflats near the airport, 17 November. Doonbeg: single birds on 15th and 23rd September. : single birds on 15 and 23 September. Kilkee: three on the beach on 7th September. three on the beach on 7 September. Newmarket-on-Fergus: two, Lough Gash on 25th September. : two, Lough Gash on 25 September. Quilty: 31, Seafield, on 4th September; five at Seafield and three at Lurga Point on 19th September; six on 20th September, six, at Seafield on 23rd and 24th September, five on 20th October. There were six at Lurga Point on 28th October. 31, Seafield, on 4 September; five at Seafield and three at Lurga Point on 19 September; six on 20 September, six, at Seafield on 23 and 24 September, five on 20 October. There were six at Lurga Point on 28 October. Shannon: at the Airport Lagoon there was one on 21st August and two on 31st August. In September there were 40 on 2nd, one on 3rd, 30 daily from 5th – 7th September, ten on 12th, fourteen on 15th and 16th, 8 on 18th, two on 19th, 8 on 22nd, one on 24th. : at the Airport Lagoon there was one on 21 August and two on 31 August. In September there were 40 on 2, one on 3, 30 daily from 5 – 7 September, ten on 12, fourteen on 15 and 16, 8 on 18, two on 19, 8 on 22, one on 24. Kilkee: four, on 10th September. : four, on 10 September. Quilty: singles, on 4th and 12th September, increasing to 25 at Lurga Point from 15th-17th. There were only five at Lurga Point on 19th September. singles, on 4 and 12 September, increasing to 25 at Lurga Point from 15-17th. There were only five at Lurga Point on 19 September. Shannon: one, Airport Lagoon, on 5th September, two on 8th, and four on 12th. : one, Airport Lagoon, on 5 September, two on 8, and four on 12. Scarse passage migrant, occasionally winters. Newmarket-on-Fergus: one, Lough Gash, from 3rd–11th September, one on 30th September. It was still there on 16th October. one, Lough Gash, from 3–11September, one on 30 September. It was still there on 16 October. Non breeding birds were as follows. Ballynacally: six at Ballycorick Bridge on 27th July. six at Ballycorick Bridge on 27 July. Clarecastle: three, at the pier, on 14th February and a single bird on 8th November. : three, at the pier, on 14 February and a single bird on 8 November. Loop Head: three, Cloghaun Lough, Kilbaha on 23rd July, one on 15th-18th September, and two on 18th October. : three, Cloghaun Lough, Kilbaha on 23 July, one on 15-18 September, and two on 18 October. Poulnasherry Bay: 43 were present at this location on 17th December. : 43 were present at this location on 17 December. Poulnasherry Bay: a total of 400 were observed on 17th December. This was the highest count received. a total of 400 were observed on 17 December. This was the highest count received. Shannon: one luecistic bird at the Airport Lagoon on 31st July. one luecistic bird at the Airport Lagoon on 31 July. Ballyvaughan: one on 12th February and 5th April. : one on 12 February and 5 April. Shannon: one at the Airport Lagoon on 13th August. Singles were also recorded on 14th, 15th 16th and 24th September. There were two there on 17th September. one at the Airport Lagoon on 13 August. Singles were also recorded on 14, 15 16 and 24 September. There were two there on 17 September. Shannon: about 2,000 were seen on the mudflats near the airport on 17th November. : about 2,000 were seen on the mudflats near the airport on 17 November. Poulnasherry Bay: an albino bird returned for the fifth season and was seen on 23rd July, 2nd and 13th August. : an albino bird returned for the fifth season and was seen on 23 July, 2 and 13 August. Clarecastle: eight at Islandavanna on 22nd April. eight at Islandavanna on 22 April. Bridges of Ross: 1,100 passed on 4th August, and 75 were noted on 21st August and were the highest counts. : 1,100 passed on 4 August, and 75 were noted on 21 August and were the highest counts. Doonbeg: two were seen in the bay on 15th September. : two were seen in the bay on 15 September. Corofin: six, near Dysart O’Dea Castle on 15th February. six, near Dysart O’Dea Castle on 15 February. Lissycasey: one on 27th November. : one on 27 November. Loop Head: twenty, The Fodry, on 7th November. : twenty, The Fodry, on 7 November. Poulnasherry Bay: sixty, on 17th December. : sixty, on 17 December. It was a good year for this species with a total of 190 birds were observed on autumn passage seventeen dates between 11th August and 1st October. The highest counts were fifty on 1st October, forty-five on 23rd September and nineteen on 27th of September. In addition to the records below, one of this species was seen flying along a wet road near Quilty on 26th September. August: one, on 18th, two on 13th, three on 26th, six on 24th and 25th, three on both 26th and 29th. one, on 18, two on 13, three on 26, six on 24 and 25, three on both 26 and 29. September: nine on 1st, one on 2nd, seven on 3rd, 45 on 23rd, two on 24th, 19 on 27th, two on 28th. nine on 1, one on 2, seven on 3, 45 on 23, two on 24, 19 on 27, two on 28. October: 50 on 1st and thirteen on 13th. 50 on 1 and thirteen on 13. Illaunaneareann: 20 on 11th August. : 20 on 11 August. Shannon: one, Airport Lagoon, from 15th –17th September (Tom Lowe, John N Murphy, John Rattigan). one, Airport Lagoon, from 15 –17 September (Tom Lowe, John N Murphy, John Rattigan). Cross: one was found freshly dead in a field at Tullig on 23rd September (D. Keane, Bill Ryan). : one was found freshly dead in a field at Tullig on 23 September (D. Keane, Bill Ryan). These are the first and second records for Clare. The Shannon bird proved very elusive, appearing for short periods at high tide. The second record was found by a very observant farmer after a period of stormy weather and was most unexpected. Shannon: one, juvenile, Airport Lagoon on 12th September (Tom Lowe). This is the fourth county record. : one, juvenile, Airport Lagoon on 12 September (Tom Lowe). This is the fourth county record. The records listed below take the total for Clare to four. Poulnasherry Bay: one on 16th August (Mattias Gierdan, Matti Eriksson, Mans Grundster). : one on 16 August (Mattias Gierdan, Matti Eriksson, Mans Grundster). Quilty: one from 12th –20th October (Gerry Bilbao, John N Murphy). : one from 12 –20 October (Gerry Bilbao, John N Murphy). This is the fifth county record. Shannon: a juvenile was present at the Airport Lagoon from 14th –18th September (Brian Finnegan, John N Murphy, Stan Nugent, John Rattigan). a juvenile was present at the Airport Lagoon from 14 –18 September (Brian Finnegan, John N Murphy, Stan Nugent, John Rattigan). Doonbeg: one was present on 16th August. one was present on 16 August. Newmarket-on-Fergus: one was seen at Lough Gash on 30th September. : one was seen at Lough Gash on 30 September. Quilty: four at Lough Donnell on 16th August. : four at Lough Donnell on 16 August. Shannon: one from 30th July – 8th August. A single bird was also present 2nd September, increasing to three on 8th and four on 22nd September, five, 13th August, 31st August and seven, 21st August. : one from 30 July – 8 August. A single bird was also present 2 September, increasing to three on 8 and four on 22 September, five, 13 August, 31 August and seven, 21 August. Shannon: one, Airport Lagoon on 18th –19th August, one on 5th September, three on 14th –15th September, and one on 17th September. one, Airport Lagoon on 18 –19 August, one on 5 September, three on 14 –15 September, and one on 17 September. This is the second county record. The last was in 1996. Doonbeg: one, juvenile, near Golf Course Club House from 27th –30th August (Nick Hallam, Ian Lewington, Tom & Nuala Lynch, John N Murphy). : one, juvenile, near Golf Course Club House from 27 –30 August (Nick Hallam, Ian Lewington, Tom & Nuala Lynch, John N Murphy). There has been an increase in the number of Spotted Sandpipers found in the country over the couple of years and this first county record was eagerly anticipated. It was an exceptional year for this species with four records, doubling the total for the county. Doonbeg: two juveniles, Doonbeg River estuary from 22nd –23rd September (John Wright). : two juveniles, Doonbeg River estuary from 22–23 September (John Wright). Shannon: one, Airport Lagoon on 30th July (Owen Foley, Harry Hussey). It was joined by a second individual in summer plumage from 5th – 6th August (John N Murphy), with one remaining until at least 16th September (Finbarr Mac Gabhainn, John N Murphy, Stan Nugent, John Rattigan). : one, Airport Lagoon on 30 July (Owen Foley, Harry Hussey). It was joined by a second individual in summer plumage from 5 – 6 August (John N Murphy), with one remaining until at least 16 September (Finbarr Mac Gabhainn, John N Murphy, Stan Nugent, John Rattigan). A total of 121 Bonxie’s were recorded on 26 dates between 23rd July and 8th October. High counts were of twelve on 27th September and twenty-six on 26th August. September: one on 1st, two on both 3rd and 7th and again on 10th, singles on 15th, 20th, 24th, and 25th, 12 on 27th, four on 28th. : one on 1, two on both 3 and 7 and again on 10, singles on 15, 20, 24, and 25, 12 on 27, four on 28. October: nine on 1st and one on 8th. nine on 1 and one on 8. It was a below average year, with a total of 73 birds observed on 13 dates between 6th August and 1st October. The highest daily count was 46 on 1st October. August: singles on 6th, 13th, and 21st, two on 23rd and 29th and two juveniles on 31st. singles on 6, 13, and 21, two on 23 and 29 and two juveniles on 31. October: 46 on 1st, one on 8th. : 46 on 1, one on 8. It was a below average year for this species with a total of 306 birds observed on 37 dates from 19th July to 1st October. A peak count of twenty-five was made on 1st October. July: one on 19th with five on 23rd. one on 19 with five on 23. August: one on 4th, six on 5th, four on 6th, six on 7th, four on 12th, six on 13th, five on both 15th and 18th, one on 20th, nine on 21st, four on 23rd, 15 on 24th, 20 on 25th, two on 26th, 23 on 29th, 22 on 30th and 23 on 31st. one on 4, six on 5, four on 6, six on 7, four on 12, six on 13, five on both 15 and 18, one on 20, nine on 21, four on 23, 15 on 24, 20 on 25, two on 26, 23 on 29, 22 on 30 and 23 on 31. September: 17 on 1st, three on 3rd, five on both 4th, four on 5th, five on 7th, three on 10th, one on 15th, one on 19th, six on 20th, one on 22nd, 19 on 23rd, one on 24th, two on 25th, 24 on 27th, 14 on 28th, and five on 29th. 17 on 1, three on 3, five on both 4, four on 5, five on 7, three on 10, one on 15, one on 19, six on 20, one on 22, 19 on 23, one on 24, two on 25, 24 on 27, 14 on 28, and five on 29. Kilkee: eight at Illaunaneareann on 11th August. eight at Illaunaneareann on 11 August. A total of 14 birds were recorded passing the Bridges of Ross between 19th July and 1st October. Most were single birds though four were seen on 1st October and two passed on both 18th and 25th August. August: singles on 13th and 14th, two on 18th and 25th, one on 29th. : singles on 13 and 14, two on 18 and 25, one on 29. September: one on 10th, one on 23rd. one on 10, one on 23. Quilty: one second year was seen from 14th –24th May, two were there on 28th July, one on 9th August and two on 12th August. one second year was seen from 14 –24 May, two were there on 28 July, one on 9 August and two on 12 August. A total of thirteen birds recorded made it a good year for this species. All records fell between 12th August and 25th November and came mostly from the west and north coasts of the county. There was one record from the Shannon estuary and one inland sighting. Quilty: one adult at the beach at the village from 19th –21st September, one adult, on 13th October. : one adult at the beach at the village from 19 –21 September, one adult, on 13 October. Treacht Beach: two adults were seen feeding with a large party of gulls on the shore on 30th December. : two adults were seen feeding with a large party of gulls on the shore on 30 December. Common summer visitor, breeding in small numbers. Cross: 40, near the village on 16th April. 40, near the village on 16 April. A total of eighteen birds were seen during the year with only one of those observed during the in spring. Shannon: one juvenile at the Airport Lagoon on 16th September with two juveniles and one adult on 22nd September. Two juveniles were seen there on 23rd September. one juvenile at the Airport Lagoon on 16 September with two juveniles and one adult on 22 September. Two juveniles were seen there on 23 September. A total of 41 were observed from the Bridges of Ross on 13 dates between 5th August and 1st October. High counts were ten on 25th August and seven on 1st October. August: one on 5th, six on both 23rd and 24th, ten on 25th, two on 29th, one on 30th. : one on 5, six on both 23 and 24, ten on 25, two on 29, one on 30. September: one on 1st, 23rd and 25th, two on 27th and 28th. : one on 1, 23 and 25, two on 27 and 28. October: seven on 1st October. : seven on 1 October. Kilkee: one off llaunaneareann on 11th August. one off llaunaneareann on 11 August. A total of 27 birds were observed on 11 dates during the year. Bridges of Ross: one on 19th September. : one on 19 September. Kilkee: three 2nd winter birds on the beach on 21st January with another 12 (all 2nd winter) birds in a field at Dunlickey Road on the same date. One, Castle Point, on 24th September. : three 2 winter birds on the beach on 21 January with another 12 (all 2 winter) birds in a field at Dunlickey Road on the same date. One, Castle Point, on 24 September. Liscannor: one adult and three 2nd winter birds, Clahane, 26th January. one adult and three 2 winter birds, Clahane, 26 January. Loop Head: one 2nd winter at Ross Bay on 6th April; one on 16th April. one first year on 24th May, and one near Kilbaha on 28th September. : one 2 winter at Ross Bay on 6 April; one on 16 April. one first year on 24 May, and one near Kilbaha on 28 September. Quilty: one 2nd winter, on 6th January. One at Lurga Point, on 11th April. : one 2 winter, on 6 January. One at Lurga Point, on 11 April. A total of 24 birds were seen during the year. Ballyvaughan: a 2nd winter on 12th February. : a 2 winter on 12 February. Illaunaneareann: one in flight on 16th April. : one in flight on 16 April. Kilkee: one 2nd winter on the beach on 10th January with eleven there on 21st. one 2 winter on the beach on 10 January with eleven there on 21. Liscannor: six at Clahane on 26th January. : six at Clahane on 26 January. Loop Head: two, 2nd winter birds were seen feeding in a field near Kilbaha on 6th April. One there on 16th April. A first year was present on, 24th May. : two, 2 winter birds were seen feeding in a field near Kilbaha on 6 April. One there on 16 April. A first year was present on, 24 May. Quilty: one adult, 13rd January. : one adult, 13 January. Ballyvaughan: one on 22nd January. Bridges of Ross: sixty on 31st August. : sixty on 31 August. Loop Head: one flew across the headland near the lighthouse on 7th November. : one flew across the headland near the lighthouse on 7 November. Bridges of Ross: 84, on 1st September, 43 on 3rd, 32 on 5th, 143 on 27th, 80 on 28th. 84, on 1 September, 43 on 3, 32 on 5, 143 on 27, 80 on 28. It was an average year for this species. All records came from the Bridges of Ross and corresponded with a period of easterly winds. Bridges of Ross: five, on 3rd September; four on 4th, three on 5th, six on 7th. : five, on 3 September; four on 4, three on 5, six on 7. Bridges of Ross: one on 27th September. : one on 27 September. Breeds at the Cliffs of Moher. Autumn passage was light however. AughinishFinvarra Point: 112, all seen between these two locations on 19th November. This was the highest count received during the year. 112, all seen between these two locations on 19 November. This was the highest count received during the year. Aughinish Island to Finavarra Point: 200 were seen between these two locations on 20th November. 200 were seen between these two locations on 20 November. Loop Head: 65, in a freshly sown field near Kilbaha on 27th July was the highest count received. 65, in a freshly sown field near Kilbaha on 27 July was the highest count received. Newmarket-on-Fergus: one was observed at Ballycar on 25th July. one was observed at Ballycar on 25 July. Ennis: one was heard calling on the Gort Road on 24th April. This was the first record of the year and corresponded with a period of southerly winds. one was heard calling on the Gort Road on 24 April. This was the first record of the year and corresponded with a period of southerly winds. Ennis: one heard calling from the grounds of Newpark House, Cappahard on 16th October. one heard calling from the grounds of Newpark House, Cappahard on 16 October. Lissycasey: one juvenile at Darragh on 12th August. one juvenile at Darragh on 12 August. Loop Head: one, Kilbaha on 8th October. one, Kilbaha on 8 October. Newmarket on Fergus: one, Ballycar on 5th April, two chicks were heard calling there on 24th July. one, Ballycar on 5 April, two chicks were heard calling there on 24 July. Shannon: one, Inishcullen Hill on 13th April and again on 22nd April. one, Inishcullen Hill on 13 April and again on 22 April. Rare winter visitor or passage migrant. Kilkee: one was seen flying over a bog during the first week of November. : one was seen flying over a bog during the first week of November. Lisseycasey: one at Boolynagleragh Bog on 20th November. : one at Boolynagleragh Bog on 20 November. Quilty: one was seen flying over the sea on 18th November. : one was seen flying over the sea on 18 November. Shannon: one was present at the Airport Lagoon on 29th March with another was seen on the evening of the 17th December at the same location. one was present at the Airport Lagoon on 29 March with another was seen on the evening of the 17 December at the same location. Ennis: one was present on the Watery Road on 17th February and another at Newpark House on 23rd November. one was present on the Watery Road on 17 February and another at Newpark House on 23 November. Newmarket-on-Fergus: one heard calling in the early evening at Ballycar on 8th October. One was found injured in the Main Street of the village and taken into care on 26th November. : one heard calling in the early evening at Ballycar on 8 October. One was found injured in the Main Street of the village and taken into care on 26 November. Newmarket-on-Fergus: three at Dromoland Castle on 22nd April were the first recorded for the year. These arrived following a period of southerly winds. : three at Dromoland Castle on 22 April were the first recorded for the year. These arrived following a period of southerly winds. None was seen at the Moyasta site, where up to two birds were seen together on several occasions in 2004. Ballynacally: one at Ballycorick Bridge on 13th September. one at Ballycorick Bridge on 13 September. Doonbeg: one on 15th August and again on 29th August in the river estuary. : one on 15 August and again on 29 August in the river estuary. Ennis: one at Drehednagowan on 3rd February. one at Drehednagowan on 3 February. Newmarket-on-Fergus: one seen at Ballycar on 21st March was the first of the spring. one seen at Ballycar on 21 March was the first of the spring. Newmarket-on-Fergus: two, Ballycar, on 4th April. : two, Ballycar, on 4 April. Quilty: a pair was still feeding young still at the nest near the pier in late September. a pair was still feeding young still at the nest near the pier in late September. Spanish Point: four on 31st March. These were the first for the year. four on 31 March. These were the first for the year. Loop Head: one flew in off the sea at the point on 19th March and was the first of the Spring. : one flew in off the sea at the point on 19 March and was the first of the Spring. Newmarket-on-Fergus: the breeding colony at Dromoland Castle had returned in good numbers by 19th April. the breeding colony at Dromoland Castle had returned in good numbers by 19 April. Inch: a flock of 70 were seen at Gortmore in late September. a flock of 70 were seen at Gortmore in late September. Loop Head: one of a. alba race was seen at Cloghaun Lough on 16th April, and two were there on 18th August. one of race was seen at Cloghaun Lough on 16 April, and two were there on 18 August. Loop Head: one was seen in and around the pond in Kilbaha from 29th July to 30th August. A different bird was present nearby at Cloghaun Lough from 17th –20th September. one was seen in and around the pond in Kilbaha from 29 July to 30 August. A different bird was present nearby at Cloghaun Lough from 17 –20 September. Shannon: a juvenile bird moved between the Airport Lagoon and the greens around the Golf Clubhouse from 15th to 19th September, and was seen by many observers. (Brian Finnegan, Tom Lowe, Finbarr Mac Gabhainn, John N Murphy, Stan Nugent, John Rattigan). : a juvenile bird moved between the Airport Lagoon and the greens around the Golf Clubhouse from 15 to 19 September, and was seen by many observers. (Brian Finnegan, Tom Lowe, Finbarr Mac Gabhainn, John N Murphy, Stan Nugent, John Rattigan). Birds seen regularly throughout the year at the Falls in Ennistymon, Doolin, Broadford and Sixmilebridge. The irruption of Waxwings reached Clare in force in early February. The highest numbers recorded together were 34 on 26th February and 30 on 21st February. The last birds were seen on 22nd March. Cratloe: 16, one mile south of village, on 22nd March. 16, one mile south of village, on 22 March. Ennis: six, Gort Road on 5th –6th February, 30, The Hermitage, on 21st February with 10 there, on 22nd February. This number increased to 30 again on 26th February. There were 26 on ClonroadGlór Car Park on 22nd –23rd March, six on the Lahinch Road on 29th –30th March, with 5 there on 5th March. One at Cahercalla on 10th December. six, Gort Road on 5 –6 February, 30, The Hermitage, on 21 February with 10 there, on 22 February. This number increased to 30 again on 26 February. There were 26 on ClonroadGlór Car Park on 22 –23 March, six on the Lahinch Road on 29 –30 March, with 5 there on 5 March. One at Cahercalla on 10 December. Shannon: 34 were seen in the Industrial Estate on 26th February. 34 were seen in the Industrial Estate on 26 February. Aughinish Island: one on 21st January. : one on 21 January. Kilrush: one was seen at the Marina on 5th February. : one was seen at the Marina on 5 February. Quilty: two females were seen on the pier at Seafield on 26th December. : two females were seen on the pier at Seafield on 26 December. Common summer visitor and summer migrant. The earliest date was 19th March for the Spring migrants and 18th October was the latest for the Autumn passage. Quilty: four, Seafield on 19th March. : four, Seafield on 19 March. Loop Head: one, 19th March. 60 were present on 4th September, 25 on 7th and six on 16th. One was present on 18th October. : one, 19 March. 60 were present on 4 September, 25 on 7 and six on 16. One was present on 18 October. Flaggy Shore: up to 80 birds, a notable increase, seen on the road-sides in this area in December. up to 80 birds, a notable increase, seen on the road-sides in this area in December. Clooney: a flock of 250 were seen feeding in a field between Clooney and Quin on 31st December. a flock of 250 were seen feeding in a field between Clooney and Quin on 31 December. Ennis: migration noted with a bird heard calling in Cappahard, Tulla Road, on the night of 14th October. : migration noted with a bird heard calling in Cappahard, Tulla Road, on the night of 14 October. Loop Head: 30 on 2nd November. : 30 on 2 November. Newmarket-on-Fergus: a large number noted passing through on migration in the morning of 14th October. : a large number noted passing through on migration in the morning of 14 October. Ennis: a flock of 22 was seen at Cappahard, Tulla Road on 20th December. a flock of 22 was seen at Cappahard, Tulla Road on 20 December. Increasingly common winter visitor, scarce breeder. Clarecastle: a male was seen on 2nd December. a male was seen on 2 December. Ennis: a male seen at Cappahard, Tulla Road, on 3rd November was seen again on 28th November; a female was seen regularly in a garden at Ballymacahill from 23rd November to 15th December and on into 2006. Another female was seen at Pine Grove on 10th December. : a male seen at Tulla Road, on 3 November was seen again on 28 November; a female was seen regularly in a garden at from 23 November to 15 December and on into 2006. Another female was seen at on 10 December. Loop Head: One at Kilbaha on 2nd November. : One at Kilbaha on 2 November. Ennis: a single bird was seen at Ballyallia on 19th and 24th March. : a single bird was seen at Ballyallia on 19 and 24 March. Loop Head: one male on 5th October. one male on 5 October. Newmarket-on-Fergus: a singing male was heard in the grounds of Dromoland Castle on 27th –28th March and again on 31st March, 3rd and 20th April. Two were heard singing there on 19th and 22nd April. One was present at Granaghan Castle on 4th April. A singing male was also heard at Ballycar on 10th, 16th, and 18th April. This bird was joined by a second on the 19th and 22nd April. Three singing males were recorded at Fenloe Lake on 22nd April. : a singing male was heard in the grounds of on 27 –28 March and again on 31 March, 3 and 20 April. Two were heard singing there on 19 and 22 April. One was present at on 4 April. A singing male was also heard at on 10, 16, and 18 April. This bird was joined by a second on the 19 and 22 April. Three singing males were recorded at on 22 April. Ruan: four singing males at Dromore Wood on 16th April. : four singing males at Dromore Wood on 16 April. Newmarket on Fergus: two birds seen at Fenloe Lake on 22nd April were the first of the year and arrived on southerly winds. : two birds seen at Fenloe Lake on 22 April were the first of the year and arrived on southerly winds. Newmarket on Fergus: one at Ballycar on 26th March was the first spring record. : one at Ballycar on 26 March was the first spring record. Loop Head: one on 2nd October with a later bird trapped at Kilbaha on 15th October. These were the latest records received. : one on 2 October with a later bird trapped at Kilbaha on 15 October. These were the latest records received. Clarecastle: one on 21st March. Ennis: one at Oak Park, 28th – 29th January, with another or the same bird seen there on 29th March. A single bird was also observed at Ballyallia on 29th January. one at Oak Park, 28 – 29 January, with another or the same bird seen there on 29 March. A single bird was also observed at Ballyallia on 29 January. Newmarket on Fergus: one at Ballycar on 15th February. one at Ballycar on 15 February. Loop Head: Three at Kilbaha on 8th October. Seven were seen there on 11th, and four on 18th. Two were observed in Kilbaha on 2nd November. Three at Kilbaha on 8 October. Seven were seen there on 11, and four on 18. Two were observed in Kilbaha on 2 November. Loop Head: one was watched in a farmyard between Kilbaha and the Lighthouse on 16th September (Christy Meehan, Maeve Meehan). This is the second county record and the first since 1986.
one was watched in a farmyard between Kilbaha and the Lighthouse on 16 September (Christy Meehan, Maeve Meehan). This is the second county record and the first since 1986. This is only the fourth county record. Loop Head: one in the garden in Kilbaha, from 28th –29th September (Killian Mullarney, John N Murphy). : one in the garden in Kilbaha, from 28 –29 September (Killian Mullarney, John N Murphy). Loop Head: twelve was the highest count recorded in the Autumn on 11th October. : twelve was the highest count recorded in the Autumn on 11 October. Loop Head: one immature Red-breasted Flycatcher was found across the road from Keating’s Pub in Kilbaha from 2nd –4th October (Aidan Kelly). : one immature Red-breasted Flycatcher was found across the road from Keating’s Pub in Kilbaha from 2 –4 October (Aidan Kelly). Loop Head: one near the Lighthouse on 7th September was the only bird recorded on Autumn migration. : one near the Lighthouse on 7 September was the only bird recorded on Autumn migration. Cratloe: one was seen at Woodcock Hill, 16th December and again on 20th December. : one was seen at Woodcock Hill, 16 December and again on 20 December. Labbasheeda: one was seen in woodland near the village on 4th December. : one was seen in woodland near the village on 4 December. Ennis: two at Lees Road Wood on 19th October. One at Ballyallia on 23rd October and again on 7th November. Two at Lees Road Wood on 4th November, with three there, 19th November. two at Lees Road Wood on 19 October. One at Ballyallia on 23 October and again on 7 November. Two at Lees Road Wood on 4 November, with three there, 19 November. Feakle: one on 9th April. Newmarket-on-Fergus: one at Carrigoran House on 17th October. : one at Carrigoran House on 17 October. Sixmilebridge: one was seen at Kilnacreagh on 27th December. : one was seen at Kilnacreagh on 27 December. A bird of the eastern race was seen in Shannon on 23rd March (Stan Nugent). Loop Head: high counts were of ten on 30th March, 27 on 5th September, and 35 on 16th September. : high counts were of ten on 30 March, 27 on 5 September, and 35 on 16 September. Illaunaneareann: 14 on 29th October. Lough Murree: one on 22nd October. : one on 22 October. Newmarket-On-Fergus: one, in the grounds of Ballycar National School on 17th November. : one, in the grounds of Ballycar National School on 17 November. Numbers of this species has declined dramatically in the last decade. Loop Head: 50 were present in Kilbaha on 4th November. : 50 were present in Kilbaha on 4 November. Loop Head: one male was seen on 18th October. : one male was seen on 18 October. Ballyvaughan: one was seen at Bishop’s Quarter on 13th February. one was seen at Bishop’s Quarter on 13 February. Loop Head: 30 on 4th September is a large number and an early date. : 30 on 4 September is a large number and an early date. This species was under reported during the year. Kildysart: two were seen on the pier on 23rd January. : two were seen on the pier on 23 January. Loop Head: “numerous” in Kilbaha on 4th November. “numerous” in Kilbaha on 4 November. Ennis: up to nine fed daily at a bird feeder at Cappahard, Tulla Road, throughout November and December. : up to nine fed daily at a bird feeder at Cappahard, Tulla Road, throughout November and December. Clarecastle: “a small flock” was reported on 8th November. : “a small flock” was reported on 8 November. Cratloe: two were seen at Gallowshill and Woodcock Hill on 16th December; another four were seen north of Woodcock Hill on 20th December. : two were seen at Gallowshill and Woodcock Hill on 16 December; another four were seen north of Woodcock Hill on 20 December. Kilmaley: two, Letteragh Wood on 28th December. : two, Letteragh Wood on 28 December. Sixmilebridge: 20, near Kilnacreagh, Fisherman’s Hill, just east of the town on 21st December with eight there on the 23rd, 12 on 24th and five on 27th. Another two were seen near Oatfield, also on 27th. : 20, near , Fisherman’s Hill, just east of the town on 21 December with eight there on the 23, 12 on 24 and five on 27. Another two were seen near , also on 27. Loop Head: one was heard calling at the Lighthouse on 18th September. Two were seen at The Fodry on 29th with another two present on 5th October. Ballyvaughan: a flock of 18 were seen at The Rine on 18th November. Kilkee: ten were seen together at Castle Point on 23rd January. Loop Head: two, near the Lighthouse, on 3rd October. A second pair was seen near Kilbaha on 6th October. The only records received were of eight birds seen together near Mullaghmore in May and a single bird was seen near Quilty in July.